Do you feel the innate call for a more inner-directed spiritual experience? Do you want to explore new resources beyond your current practices? Are you on an “awakening” journey and hungry to know more? Will you use your own challenges as your path for spiritual evolution? These are also my interests as I continuously expand my ability to communicate with my Higher Self, and I love to share what I know with others via the coaching process. 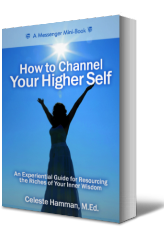 Advance your skills of communication with your Higher Self. Learn to recognize and interpret the messages flowing to you. Practice simple, useful tools to integrate the guidance you receive. Apply these new tools in your everyday experiences. Try out Higher Consciousness Coaching at no risk. All packages include a Bonus Sample Session to decide if we are a “fit”. Live a more honest reflection of who you really are. Feel authentic in your relationships with others. Experience a deep sense of self-empowerment. Know true freedom of self-expression. Discover that inner peace is possible regardless of outer circumstances. Recognize your own happiness is an inside job. Sense a state of grace surrounding you. And that’s a pretty cool way to be in this world! If you are a Spiritual Explorer who desires these kinds of results, come form a Higher Consciousness Coaching relationship with me to bring this way of be-ing into your day-to-day experience.